Felicidades to all the Juans, Joans and Johns – why not celebrate by getting chased by a devil with a 6 foot sparkler? You may have noticed that last weekend was a bit more crowded than usual in Valencia city. You will have most definitely noticed if you live near a casal fallero and subsequent lairy verbena aka. mobile disco/karaoke/”I’m gonna play the Game of Thrones theme tune at full blast at 3am” fun times. This all comes as standard in the run up to San Juan, a popular festival that welcomes in the Spanish summer. The 23rd of June marks the eve of San Juan, or the day of Saint John the Baptist. And how does Spain commemorate Saint John? With fire. And fireworks. And more fire. And beer. 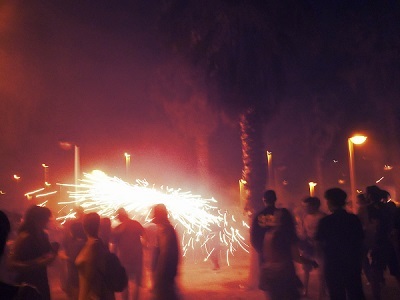 Cue the gathering of thousands of jóvenes on Valencia’s beaches while dozens of bonfires, chinese lanterns and fireworks light up the Mediterranean coast. 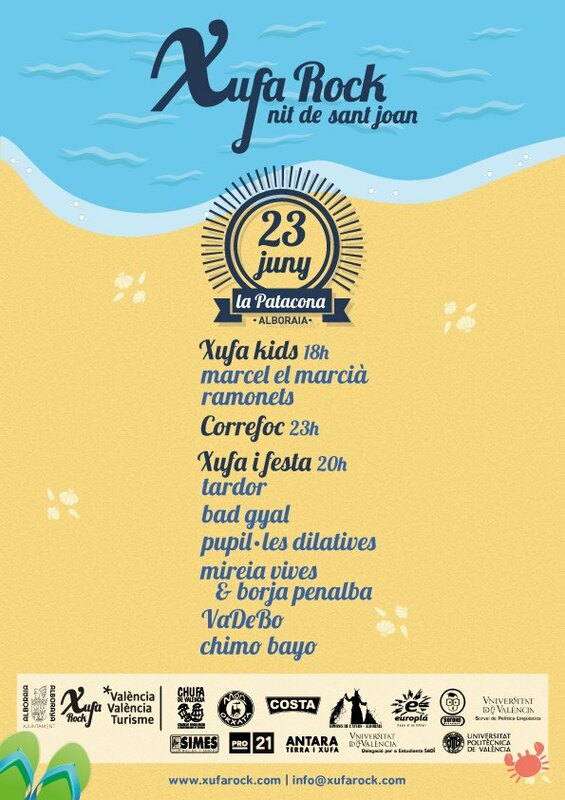 Head to the Patacona beach in Alboraya, just north of the city, for this year’s edition of the ever popular Xufa Rock and enjoy the balmy June night watching local bands with a cold beer. And don’t forget to go and jump over some waves at midnight on the shortest night of the year to guarantee good luck for the rest of the year. You could also try jumping over a bonfire three times to the same effect… if you’re that way inclined. And that’s not all. At a certain point of the evening…there are men. Men dressed as devils. Men dressed as devils running at you with huge, spinning fireworks. Picture the scene: it’s hot, you’re wearing shorts and flip flops, dancing devil-men aim their massive sparklers at your bare and vulnerable lower half and chase you through the palm trees, locals adopt a “me la suda” attitude and wade right into the thick of it with toddlers flung over their shoulders, there is a screeching dolçaina backdrop which makes the scene all the more chilling. Welcome to the corre foc fire run! Meanwhile, our friends down in Alicante are celebrating by having a sort of mini Fallas 2.0 in honour of San Juan. Why so many fires and fireworks, Spain? Could San Juan beat Las Fallas for the “epitome of lax Spanish health and safety” award…? Buses 2 and 31 take you close to the Patacona beach in Alboraya – get off at the end of the line. If you’re heading to Valencia’s main beaches, the Malvarrosa or Las Arenas, use bus 31 or the line 4 or 6 tram alighting at Eugenia Viñes or Les Arenes. EMT are providing a 24 hour service during the night of San Juan.